Above: Young, bright, and impeccably courteous, Sanju cycles every day into Nasik to sweep its streets. Only Dalits do this work, he says, and his own prospects of doing anything else are severely restricted by the glass ceiling imposed by his caste. Many Dalits here are Buddhists, including Sanju. They embraced Buddhism in the footsteps of the iconic Dalit figurehead, Dr B.R. Ambedkar. Above: Balu was born into the Mangarudi sub-caste of Dalits, before converting to Buddhism in the footsteps of the iconic Dalit figurehead, Dr B.R. Ambedkar. 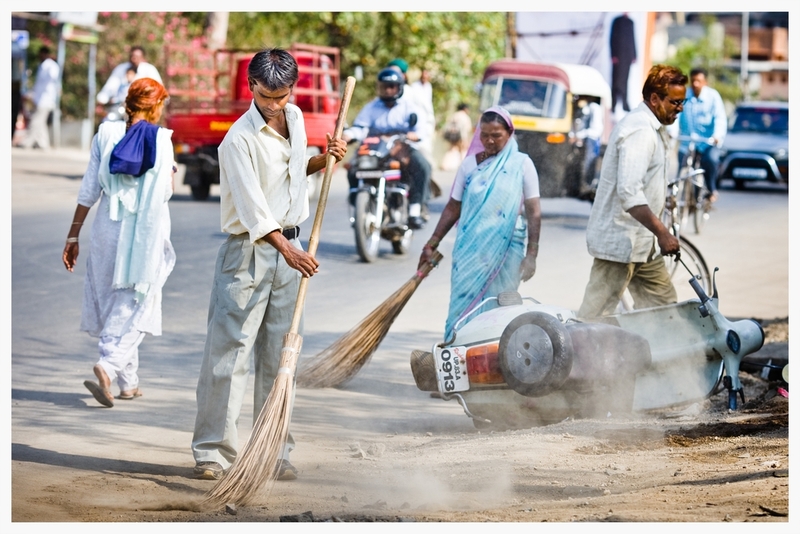 He is employed by the municipality as a sweeper, but his work involves dredging open gutters without any form of sanitary protection.